Free lunchtime entertainment on weekdays all summer long on Courthouse Square in downtown Dayton. The Square Is Where - Free lunchtime entertainment takes place daily on Courthouse Square. From trivia to live music to giant outdoor games, it’s a hot spot for lunch. A variety of performers will take the stage around the noontime lunch hour on most weekdays during the summer months (May - September). Guests can grab a picnic table and bring their lunch, or pick up something tasty from a local restaurant or food truck. Live entertainment includes bands, dancers, live trivia, arts groups, acoustic musicians and more. Visit downtowndayton.org for the daily schedule. 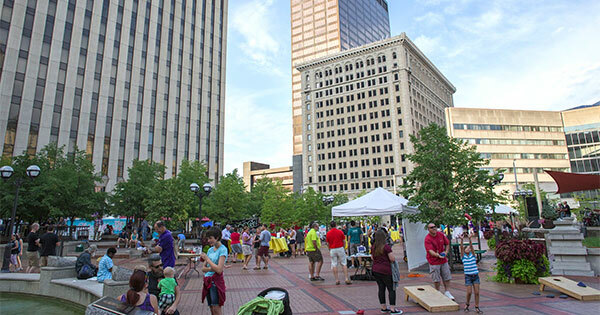 Find more events like "Lunchtime Entertainment at Courthouse Square"
A nonprofit organization that includes information about working, living and having fun in downtown Dayton. Courthouse Square, operated by the Board of County Commissioners, is an outdoor entertainment facility located at the corner of Third and Main Streets in the heart of downtown Dayton.